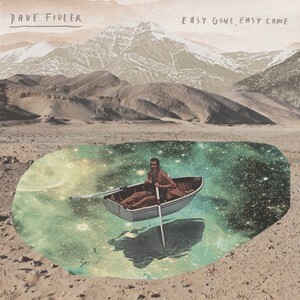 Easy Gone Easy Come is Dave Fidler's new EP. It features two tracks from his recent album I'm Not Here, a live cover of Jackson Browne's These Days and a live version of his own A Song For Nico as well a new track Follow Me. It's an EP that shows off the deeply personal side of his songs. Easy Gone Easy Come will be well-known to regulars on here. It's a beautifully honest and sincere song written for his son from the viewpoint of a parent with the joy of watching their child come into the world - "my heart was singing out when I found out" - just after the loss of his own father and wondering how things will turn out for him - "will you learn from your mistakes, will you punch above your weight?". It's a song that has a simple immediate emotional connection that so many will be able to relate to and that's the beauty of a lot of Dave's songs. Next up is Ailsa, an equally poignant song written about someone close to him. It's a song about helping someone to get through a particularly bad time in their life, simply by being there for them. Like Easy Gone before it, its beauty is in the simplicity of the delivery, the emotion that comes out of every note Dave plays, recorded as it was on a reel-to-reel tape to capture the warmth of the guitar as well as his voice. These Days is a beautiful live-to-tape cover of the Jackson Browne song with some subtle pedal steel guitar underlying Dave's acoustic. Stripping it back to its bare bones it feels extremely intimate and heartfelt. Next up is a live version of album track A Song For Nico. A very emotional song for Dave as it's about the birth of his daughter - "dragged you out in the open, tiny bones and a fragile frame, from the moment we knew you, reduced us to tears" - after an uncertain time leading up to it. This version is also a live take from his album launch last year and features Amy-Charlotte Williams on backing vocals. The EP is finished off with Follow Me which marks a change in style for Dave's solo work. It hints at his previous bands Bluebird Kid Clark and Dave Fidler And The Corvettes rather than the solo acoustic approach of I'm Not Here and if it's representative of the new material Dave's writing then his next album could be something quite special. Lyrically, the emotion comes from the direct simplicity of his lyrics that say everything they need to do without any hint of mystery or "I want you and me to be free, follow me, I'll take the long way home," the last line of which is sung repeatedly against a backdrop of subtle backing vocal harmonies as the song comes to its conclusion with an aching throbbing pedal steel sound. Easy Gone Easy Come is a reminder that Dave Fidler is one of Manchester's most criminally underrated and overlooked singer-songwriters, both on the album tracks, but in how he rearranges A Song For Nico for the live performance and the future that Follow Me points to.